What is the Difference Between Cat Hair and Fur? You will see mentions of both cat hair and cat fur. The two terms are often used interchangeably, but is there any difference? All mammals have hair, whether they be humans, whales, pigs, elephants, cats, dogs, or monkeys. The hair has a different appearance, feel, and purpose, depending on the development of the individual species. Technically speaking, the term fur is generally confined to mammals with very thick body hair. Humans have sparse body hair, so it's usually not called fur. With cats, you will often see body hair called fur. With some "hairless" breeds, such as the sphynx, the short, downy stuff that is almost invisible is usually called "hair." Terms like "hairballs" are to describe the fur cats swallow and then hack up, while people affectionately refer to their cats themselves as furballs or furkids. You can think of "cat hair" as an individual strand and "cat fur" as collective, e.g., a cat hair is what you find on your black sweater. There may be many of them, but they are not all massed together like fur is on your cat. When grooming your cat you may either "comb its hair" or "brush its fur." To complicate things further, breeders often describe the overall appearance of a cat's fur as its ​coat. You will see this term used almost exclusively in breed standards, but you will also see "hair" mentioned, as in longhair or shorthair breeds or divisions. The bottom line is that you will be correct whether you call the fluffy, fuzzy stuff that covers your cat hair, fur, or coat. Use the term that is most comfortable for you. Like all hair, cat hair originates in the epidermis (under the skin), and the type of hair determines the structure. There is a muscle next to the root, just under the skin, that is extremely sensitive to temperature. In cold weather, or when a cat is frightened or alarmed this muscle contracts, causing the attendant hair to "stand straight up," creating that "Halloween cat" look that is so familiar. Cats may have from one to three types of hair in their coats, referenced sometimes as "double coat," or "triple coat," plus those distinctive whiskers, which are also hairs. Whiskers are the long, thick, tactile hairs extending from the sides of the muzzle, the cheeks, above the eyes, the cheeks, and at the outside of the lower legs on cats. Whiskers are extremely sensitive and play an important role in cats' ability to gauge openings, find their way around in total darkness, and they may even contain a scent-sensing ability. Whiskers are also an important factor in revealing cats' body language. ﻿Guard hairs are the longer, stiffer hairs that extend out past the "base coat" (awn hairs). These are the hairs that usually determine the basic color of the cat. Guard hairs help in retarding water to keep a cat dry. The undercoat is also called down. It is the softer, fluffier hair that provides warmth. This is the hair that tends to mat if a cat is not groomed regularly. 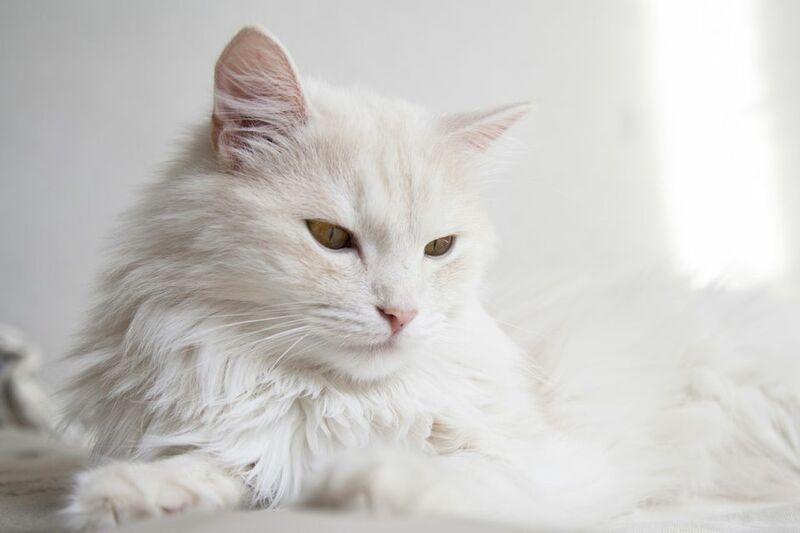 There are several different definitions of awn hairs, depending on the breed of cat, but awn hairs usually form the basic coat. In some breeds, the (finer) awn hairs may be the same length as the guard hairs, while in other breeds, such as the Manx, the guard hairs are longer. As in humans, curly hair in cats has flattened shafts while straight hair has round shafts. The allergen cats carry is a tiny protein particle called Feld1, which is found in cats' saliva. They transfer it to their hair when grooming, where it dries into microscopic flakes, commonly called dander. Very long or thick cat hair will hold more dander, which is where people get the misconception that the "hair" is the allergen. Dander can also be found all over the house: in the air, in bedding, and in carpets and drapes. The good news is that in many cases, allergies to cat dander can be controlled. Is Hair Loss on Your Cat's Hind Legs Normal?